Should You Have a Swimming Pool? Do individual features make or break the sale of your home? Take swimming pools, for example. Buyers shopping for a house in a warm climate may shriek with excitement when they see you have a swimming pool in your backyard. They’ll be able to keep cool on a hot day. However, those looking for a house in a location that boasts chilly winters may think twice before purchasing your poolside abode. Why would they need a pool when it’s 10 below and snowing for three to four months out of the year? •	Location: Think about how the climate is in your area on a month to month basis. Can your pool be used year round? Some locations are quite cold during certain times of the year, forcing residents to utilize a swimming pool for only three to five months. •	Neighbors: Do other homes in your neighborhood have pools? If you’re the only one on the block, you may have an advantage. •	Zoning: Are you allowed to add a swimming pool? If you live in a gated community, you might not be able to buy one, if you’re already paying dues to use a community pool. Check your village hall or home owner’s association. •	Cost: How much are you willing to spend? Inground pools are pricey, but they are more aesthetically pleasing than aboveground pools. 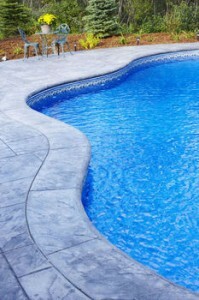 Pool lining also varies, with fiberglass, cement and vinyl options ranging from high to low in price. You need to choose the type of pool based on the amount of money you will be able to make back once you sell your home. •	Maintenance: Auto-cleaning pools are more desirable to a potential buyer. Sometimes, when buyers see a pool, the first thing they think about is all the work they will have to do to maintain it. The less work they have to do, the more they will be into the idea of owning a home with a pool. It’s becoming more and more common for floor plans to incorporate mudrooms, providing you a convenient entry into your home, as well as possibilities for other uses! What is a mudroom? Essentially, the name speaks for itself. It is literally a room used to hang wet coats and leave muddy shoes, sweaty sportswear or dirty laundry. More times than not, the mudroom door is the one immediately shut when guests pop over. It can be a hidden, secret mess of clutter that no guest is allowed to witness. But though the room will most likely take a beating, it doesn’t have to be hidden away from the human eye! There are ways to use the mudroom efficiently while keeping it uncluttered and attractive! If you’re selling your home, keeping the mudroom clean and uncluttered is vital. Potential buyers are picturing themselves living in this home while they view this room! Flooring: The mudroom will most likely receive the ill effects of mud, snow, slush, rain and all varieties of nasty weather remnants. Vinyl and laminate floors are easy to keep clean, but they could also get slippery when wet. Wood is hard to care for, especially when wet. The best choices are ceramic/stone/terracotta tiling, rubber or stained concrete. Dark colors will hide the dirt. Indoor/outdoor carpeting is an option for areas with mild weather conditions. Walls: Your best bet is to cover your walls with vinyl wallpaper that you could easily wet down. Otherwise, display wainscoting or textured patterns that will hide dings and dirt. Beaded boards are perfect for hanging extra items! Use an oil-based paint for cabinets and walls to prevent mildew. Storage: This is the number one priority! The more storage opportunities that exist, the less cluttered your room will be. For a more custom approach, add built-in cabinets and cubbies in the wall. For an easier, cheaper idea, purchase one huge cabinet fixture and nail it to the wall. It could include cubbies, shelves, cabinets and benches. Each household member could have his or her own cubby or shelf! A bench is ideal for sitting on while taking off shoes, and it’s sturdy enough to use for permanent storage above or underneath. Brightly colored walls make the room more inviting. Guests will be amazed with a mudroom that is open, bright and uncluttered! You could add coat hooks to any wall, anywhere. Buy different sizes for winter coats, rain coats, dog leashes, key chains and everything you want available in a quick grab! Place all your items in a basket, and then place the basket on a shelf. This hides the clutter from people who are walking through, and each household member could store items in his or her own basket! Mudrooms are often also used as laundry rooms. Make sure your machines are cleaned and in top-notch shape. Add a wire shelf above the machines for detergents and such, and also for hanging clothes on hangers! Use all of the wall space that is available! In order to save your flooring, decorate with multiple mats that could easily be switched or cleaned. Have a different mat for each holiday or season. Have fun with it! The more décor that you contribute, the more you’ll want to keep the room clean and visible to guests. What If You Don’t Have a Mudroom? Even if your floor plan doesn’t include a mudroom, there are ways for you to create extra storage space where needed. In the foyer, display a coat tree as a custom approach to keeping the area uncluttered. In the kitchen, keep a plastic bin near the back door for shoes or sports equipment. Purchase a tall cabinet piece and use it in place of a closet. Place a doormat outside of the door and inside of the door for the utmost cleanliness. Plenty of options are available for keeping your home clean and uncluttered!